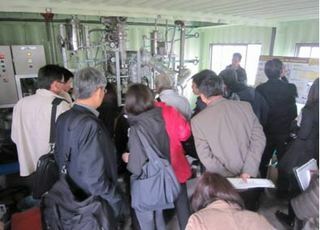 A Visit by Inspection Group of Singapore Environment Ministry: リサイクルエナジーブログ　RECYCLE ENERGY CO.,LTD. 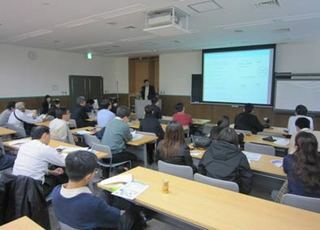 Thanks to Kitakyushu Asian Center for Low Carbon Society, we are pleased to have the chance to introduce our oil-converting plant to the inspection group of Singapore Environment Ministry while they visit Japan. 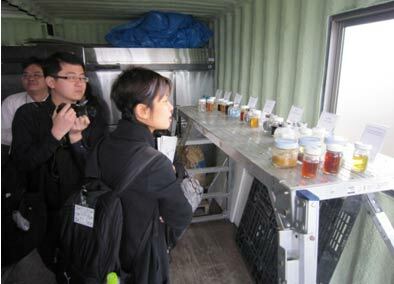 The inspection group includes mainly members from environment laboratory (subordinate agency of Singapore Environment Ministry), environmentally-related enterprises and universities – totally 23 people. One of them is a private company with the plan to buy an oil-converting plant in progress so this is our best chance to promote our product! We started with a presentation with special proposals exclusively for SG government so everyone was listening to it with concentration. After that in the Q&A corner we got a lot of questions – a good sign to know that people were highly interested. Then everybody was moving to our laboratory in Kitakyushu to see the actual operation of our pilot plant (processing ability: 5kg/h). Everybody snapped a picture when the operator was extracting the cracked oil from the machine. Today we used pellets made from household garbage such as plastic containers and shopping bags as feedstock and we also demonstrated other samples of waste plastics and oils. Due to the favor by Kitakyushu Asian Center for Low Carbon Society and the request from SG inspection group, we had double time to introduce our plant. We believe this is a good opportunity to let more people know the goodness of our plant and we would like to keep in touch with everyone who had ever visited here from now on.